Many breeders of pedigree dogs in Britain put 'type' at the top of their list when it comes to placing, in order of priority, their breeding desiderata. Despite that, it is disappointing to note just how many breeds have lost their essential 'typiness' over the years. 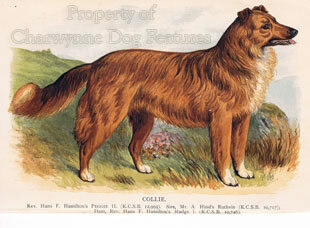 Breeds like the Bull Terrier, the Newfoundland, the Shetland Sheepdog, the Bulldog, the Bloodhound, the Rough Collie, the St Bernard and the Dachshund get less and less like the early specimens of the breed with each generation. On the other hand, breeds like the Border Terrier, the Deerhound, the Curly-coated Retriever, the Dalmatian, the Schipperke and the Pug seem able to resist human whim and retain the truly traditional look of the breed. Exaggerations exaggerating themselves play a part, as the basset hound illustrates. Unwise blueprints play a role too, as the two words 'muzzle - short' in the breed standard of the Bullmastiff demonstrate increasingly each year. For me, there are two very simple criteria to be brought to bear here. Firstly, if you admire a breed and respect its ancestry, why make it look like something different? To do so is an entirely irrational act. Secondly, if you love dogs and one breed above all others, how can you possibly justify breeding dogs of that favoured breed with an anatomy which is not only quite unlike that of their ancestors but one which threatens their health and well-being? To do so lacks any real affection, merely indicates self-interest and the absence of any real empathy with subject creatures. It should be possible to look to the governing body, the Kennel Club, and their advisers , the breed clubs, for responsible guardianship. But what is the reality? Our pedigree breeds are almost without exception less healthy than eighty years ago, with temperament so overlooked that we end up with the misguided Dangerous Dogs Act punishing blameless dogs. Far too many breed clubs too attract those who want the acclaim of winning and the power of being judges, above all else. The best bred dogs that I see in Britain are Foxhounds and Harriers. The most responsible body in dogdom is so often the International Sheep Dog Society. Unless we retain breed type, breed vigour and give the highest priority to temperament, then the pedigree dog "bubble" could burst. It would not take an immense shift of interest for the animal rights activists to turn their attention from blockading ports to campaigning against Bulldogs that can't breathe, Basset Hounds with slipped discs, chows with inbred entropion, Great Danes with primary glaucoma and collies with CEA. We live in times when indirect cruelty towards animals no longer escapes public scrutiny. Unless the world of pedigree dogs puts its own house in order, somebody else will! Physical and mental soundness are key ingredients of type. Our ancestors, who pioneered these magnificent breeds we own in our lifetime, knew that the correct type brought soundness with it. Were the early Newfoundlands, used by wildfowlers like the celebrated Colonel Hawker in the most testing conditions of terrain and weather, unsound? How long would a Bulldog last in the bull-baiting ring if it were unsound? Why did the hunting basset fraternity outcross to the harrier when they realised that soundness and functional type were in peril in their breed? And why did Brough, the pioneer Bloodhound breeder, advocate an outcross in every fifth generation? The maintenance of type and the pursuit of excellence must never be perverted by the seeking of purely cosmetic appeal in one or two generations of owners. The old breeders, so many of whom were livestock breeders too, knew that once you got the 'type' there, soundness and physical excellence accompanied it. But when you lose type, you more or less lose the breed too. Earlier this century, Lt. Col. G. H. Badcock was writing, in his "Disobedient Dogs": "While there are, of course, a host of useful breeders, there are also a multitude of useless ones. These latter simply look on dogs as a commercial proposition...this spirit of commercialism has a disastrous result as regards what is known as type in dogs." Even a cursory glance around the show benches of today illustrates the sad accuracy of Badcock's words. That simply admirable breed the Newfoundland is now being bred to look like a mountain dog, with a lumbering gait actually being desired. Colonel Hawker, the best shot of his day, wrote in glowing terms in his 1814 diary of the Newfoundland retriever, but "not the heavy brute that so often and so commonly disgraces the name of the Newfoundland dog." It is distressing to note that in the FCI grouping of dog breeds, this distinguished breed - once known as the Great Retriever and father of our modern retriever breeds, is in Group 2: Pinscher, Schnauzer and Mountain Dogs. Is it surprising that this remarkable water dog is now assuming the anatomy of the Hovawart, the Leonberger and the St Bernard - with the inevitable loss of type? 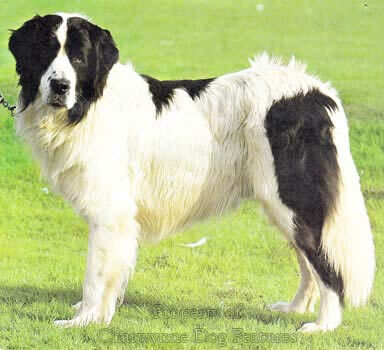 The early St Bernards, so admired in Victorian England, were much more like their sister breeds, the Bernese Mountain Dog, the Entlebucher and the Appenzeller, than the St Bernards of today. How long would a loose-lipped drooling dog of any breed last in freezing Alpine snows? Why cannot the fanciers of this breed show respect for the oustanding service to man of their fine breed? This applies too to bloodhound breeders. I was informed by an enthusiastic bloodhound exhibitor at Crufts some years ago that the excessive loose skin or cowl was meant to cover the hound's eyes when tracking so that it had to use its nose! He was nonplussed when I showed him a photograph of perhaps the most famous tracking Bloodhound of all time, "Druid", which clearly showed no excessive skin at all. 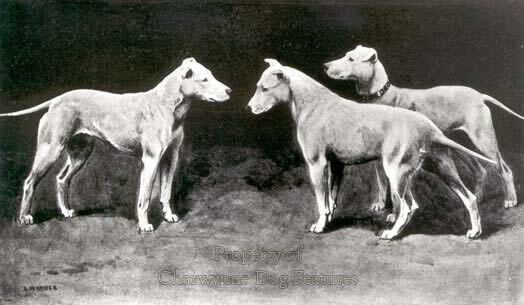 The pedigree breed badly needs an outcross to a pack Bloodhound or a Dumfriesshire Foxhound if true type is to be restored. I am a Bull Terrier fan but I have no wish to own a dog with a ruggerball for a head. How can such a feature be justified? It is not historically correct. I meet would-be bullterrier owners quite regularly who will not proceed with a purchase whilst this strange head is a breed feature. There were over three thousand bullterrier registrations in 1989 but only 1810 in 1993. Fourteen years ago when I wrote of my concern over the loss of true type in the head of this splendid breed, the wealthy owner of a large kennel wrote a patronising response, not answering the points being made but defending his personal whim. That perhaps illustrates very aptly the point that breeders and breed clubs can at times lose their way and firm guardianship at Kennel Club level is vital in perpetuating true type in our precious breeds. I am not advocating for one moment that we only breed pedigree dogs to look like their distant ancestors. The founding dogs in a number of breeds were physically quite dreadful and skilful breeders have improved quality discernibly since those early days. But type can be lost in any breed at any time if breed clubs are not collectively vigilant. It is never a case of type perpetuating itself; it has to be consciously sought. Genetic tendencies have to be countered if they lead breeds away from the essence of the breed. The short face for example is dominant and in breeds like the Bullmastiff, breeders have to be watchful that muzzles don't become untypically short and giant fawn or brindle Bulldogs result. Basset Hounds and Cocker Spaniels now have ears which are untypically too long. Rough Collies and Shetland Sheepdogs now have coats which are untypically too heavy. Dachshunds' legs are now untypical because they are too short. Stockard concluded many years ago that short legs were dominant. At what stage do we acknowledge that they have become too short in a breed, too short that is for the good of the dog rather than the pocket of the breeder? We are steadily losing the true Labrador head. Our Airedales sadly seem to get more soppy each year - how I miss the gameness and spirit once such an attractive feature of this excellent breed. Is a German shepherd dog with a roach back, hyper-angulation in its hindquarters and a lack of substance, with two show-ring wins and KC registration to be preferred to an upstanding, well-boned and symmetrically built dog with a level topline but no papers? Contemporary GSD breeders seem to have lost their way and it's going to take decades to restore true type to this quite outstanding breed. I wholeheartedly agree with Lady Malpas, who wrote a few years ago to one of the dog papers: "There can be no justification for any attempt, accidental or intentional, to produce different types of German shepherd." I also support the view of a GSD breed correspondent who wrote: "What has happened to this noble breed? 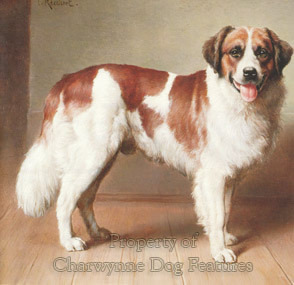 I was brought up in the school that had as a pattern dogs like Ch. Fenton of Kentwood, Ch. Sergeant of Rozavel and other famous dogs of similar type. 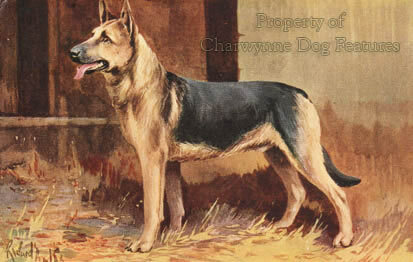 My mentors told me that a good Alsatian could carry a glass of water on its back without spilling when moving..."
In any breed of pedigree dog it only takes one determined breeder with more money than sense to promote his concept or a dominant clique to gain ascendancy for true type to be threatened. Breeds don't just lose type; breeders lose their way. But who lets them? Two hundred years ago, Edmund Burke was writing: "An event has happened, upon which it is difficult to speak, and impossible to be silent." Those who love dogs for what they are, as opposed to what they're worth, must always find it impossible to be silent. In this way gratitude is shown to those who handed our precious breeds of dog down to us. It demonstrates too an awareness of our duty to those who come after us. If you care - speak up!